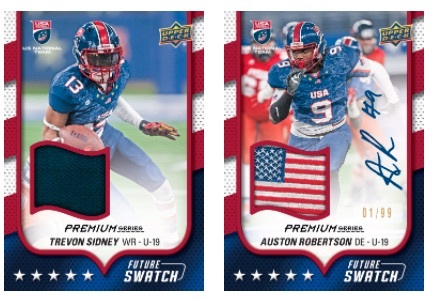 While UD has a tradition of producing U.S. National Team cards for the gridiron, the prospect product shifts to a new format. Unlike the '15 edition, 2016 Upper Deck USA Football moves to ePack but the focus remains the same with cards for various teams and even Canadian players. The 200-card base set is split into age groupings for U17, U18, and U19 teams for the United States as well as U19 for Canada. Although all these base cards are digital, the physical copy of the Flag Wave parallel can be earned by combining ten of the same base cards (#1-200) to form one hard copy that can be mailed. Of course, the 2016 Upper Deck USA Football hits are also matched in physical form once they are redeemed with COMC (Check Out My Cards). These include Autographs at overall odds of 1:4 packs and Memorabilia cards at odds of 1:10 packs. More specifically, 2016 Upper Deck USA Football has Base Autographs for the U18 and U19 teams with Dual Autographs for the U17 subjects. Relics include Future Swatch Jersey inserts for the U19 teams in Canada and the United States as well as Premium, Logo Swatch and Flag Swatch versions. Finally, ePack set collectors are rewarded with as many as five Patriotic Prospects Achievements cards that are earned by collecting specific sets from 2016 Upper Deck USA Football on ePack. 2016 Upper Deck USA Football sells for $3.99 per pack and $76.99 per box on the ePack website. PARALLEL CARDS: White Border, Flag Wave. DA-PB Dondre Baker/Camron Pitcher Jr.
5 cards. Required set completion noted below to earn card.